Armor Inkanto Thermal Transfer Printer Ribbons supplied by TT Ribbons. 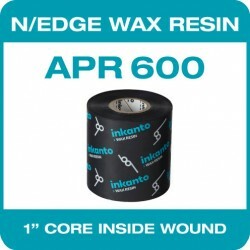 This range of ribbons are for Thermal Transfer Printers using near-edge technology and the Armor range of thermal transfer ribbons for these Industrial Printers are wound Inside and outside wound on a 1" Core. Ideal for printing on Semi-Gloss Paper / Tag /Ticket Stock and Synthetics. 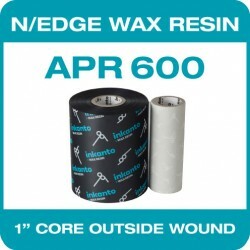 APR 600 gives good level of smudge, scratch and heat resistance. Excellent printing quality for all types of barcodes, very small text, large characters and logos. APR 600 - Near Edge Inside Wound on 1" core. Boxed in 25's. APR 600 - Near Edge Outside Wound on 1" core. Boxed in 10's. APR 600 - Near Edge Inside Wound on 1" core. Boxed in 10's. APR 600 - Near Edge Outside Wound on 1" core. Boxed in 5's. Which Ribbon do I use for my labels?